This week is National Nanny Appreciation Week. A special thank you to all the nannies who work with our kids. The big and little things you do everyday make an important impact on the lives of so many people. If you have a TLC nanny please take a minute and share with us on the TLC Facebook page why you and your kids love your TLC nanny. Your comments will enter your nanny into a special Nanny Appreciation Week contest. So, please take a minute let us and her know how much she is appreciated! TLC for Kids has more than just sitters to help parents and families adjust to having a new baby at home. TLC for Kids also has a certified sleep consultant on staff who helps parents get their baby or babies on a sleep schedule that works for their lifestyle. 1. Reduced stress levels. When you and your baby are not getting enough sleep, everyone is crankier. With a sleep consultant, you can set up a schedule and routine that fits your lifestyle and meets the needs of your growing baby. When done correctly, this will lead to less crying for your baby and more productive days for you (after all, nobody is good at their job when they were up all night with a crying baby). 2. Consistency. Humans are creatures of habit. In fact, parents who are consistent with their children are shown to raise children with lower anxiety levels. During a sleep consult, you and the consultant can talk about your daily and nightly activities and brainstorm a nighttime routine that works for your family and baby. For example, if you read a book and take a bath every night before putting your baby down to sleep, your child will associate these activities with bedtime. Putting them to sleep will become less of a hassle because they already know bedtime is coming. 3. Answer questions. A lot of times a pediatrician can tell parents how much sleep their child should be getting, but doesn’t offer solutions on how to make sure their baby sleeps for the recommended amount of time. With a sleep consultant, parents have access to someone who has specialized training on baby sleep patterns. A sleep consultant is here to help get your baby to sleep, so parents won’t have to wonder if what they are doing is wrong or right. With a sleep consultant, parents can evaluate their baby’s sleep environment and routine (do they have blinds in the baby’s room? Is there a sound machine? What did they do before bed? ), and see their strengths and weaknesses. To learn more about TLC’s “Sleep Lady” Consultant and set up your consult call the TLC office today (314) 725-5660. A new baby in the house is a transition for everyone. While welcoming home a new baby with hugs and love is amazing, sometimes bringing home a baby can be overwhelming. Mom is recovering, Mom and Dad are sleep deprived, and siblings miss being the center of attention. Find a nanny or babysitting job in the St. Louis Area? Care for and nurture young children? Provide fun learning and age appropriate activities? Make a real contribution to a family? Then TLC for Kids is here for you. We help caregivers find great nanny positions in St. Louis, Missouri and South Florida. Click here to begin your job search! 2) Full-time nanny needed in Chesterfield, MO. Twin girls are 3 y/o’s and family would love someone with a preschool background. M/T/TH 12p-6p and W/F 7a-6p. Pay is also $550+/wk. 3) Part-time live-out housekeeper / nanny needed in Belleville, IL. Two families will nanny share for M-TH. Applicants must have housekeeping experience and references. This is also a permanent position (1 year+) and will pay between $15-18/hr. 4) Part-time nanny needed in University City, ASAP! Schedule is Monday, Tuesday and Thursday 8a-6p. Toddler is very active, and 10 mos. old will be soon! Mom is seeking someone very calm and patient. Schedule is a little flexible. Pay is between $13-16/hr. 5) Part-time morning position in Clayton. New baby (4mos. old) will need care 8a-1p M-TH. Must have infant experience! Starts ASAP! Contact Jessica@tlcforkids.com if you have any questions. Thinking about hiring a nanny? Finding the right nanny for your family can feel overwhelming, so TLC for Kids has created a step-by-step guide to make the process as easy as possible. Step 1: Determine this is right for your family. 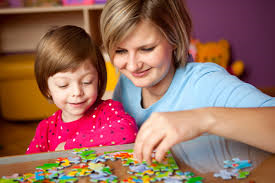 Having an in-home child care provider is a big step for any family. A nanny becomes a part of your life and sees everything that goes on, as if they are a part of the family too. To determine if this is right for your family, we suggest sitting down with your spouse to determine your budget and make a list of the tasks you need help with. Once you have clear expectations for a nanny, finding the right one for your family will become even easier. Step 2: Contact TLC for Kids. Once you have determined a nanny is right for your family, you should contact the agency as soon as possible. You will start your nanny search by writing a detailed job description. This description or profile is what the nannies see. It should include information about children, the job responsibilities, the hours needed and the salary range. It is best to be as specific as possible. If you want the nanny to help with laundry and dishes say that instead of light housekeeping. 3. Start interviewing. After you complete your profile TLC will be able to start your nanny search. TLC will send you qualified and interested caregivers to review their profiles and interview. Initial interviews can be done over the phone but before making a final hiring decision you should meet the candidate face to face. Starting the interview process early gives you and your selected nanny time to work out a schedule and host play dates with your kids and nanny to see how they interact together. Interested in starting your nanny search today? Call TLC for Kids: (314) 725-5660.